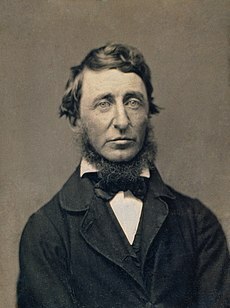 Today is the birthday of Henry David Thoreau, born in Concord, Massachusetts on July 12, 1817. That would make him 197 years old, if he were still with us. Being a figure in American history rather than biblical history, he died at age forty-five, two years shy of what a male born in 1817 could expect to live. If he was born in1917, he might have lived a little longer, but only a little. Life expectancy in 1910 was just 48.4 for a male, not much improvement since 1817. By 1920, it rose to 53.6. There was more gained between 1910 and 1920, just ten years, than the eighty-three years between 1817 and 1910. I think my first introduction to Thoreau was as a college freshman when my English Lit professor put WALDEN, OR LIFE IN THE WOODS, on her required reading list. She has long since gone on to that great library in heaven where I hope to go one day, so I can now confess that I did not actually read the book. I suspect she knew that at the time. When I was assigned such an exciting book in a high school English class, I was always able to find it in a Classic Comic Book edition. Remember those? They saved many a high school student of my time from the painful task of reading such great classics as SILAS MARNER. I have checked the complete list of Classic Comics and found that Thoreau’s WALDEN was never published in that format. Since the internet was more than 30 years in the future, I am not sure how I ever wrote the required paper on WALDEN. But I did. It is that last bit, “and not, when I came to die, discover that I had not lived,” that has forever haunted me. The individual’s ongoing search to find meaning and purpose in his or her life has always interested me. My favorite books are those written in the first person, whether fiction or nonfiction, where the main character is trying to convince himself that at the end of life’s journey he will not discover that he missed it, that he wasted the brief time allotted to him in a meaningless quest for pleasure and for treasures that in the end will rot away like a fallen tree in the forest. All is vanity” (Eccles. 1:1; ESV). How many people have been born and died through all the ages? The multitude has come and gone without ever being noticed by anyone except God. They spent their whole lives in daily toil trying to avoid confronting the question of whether or not it would have been best if they had never existed. This, I believe, is what WALDEN is really about. Thoreau separated himself from all the distractions around him in order to learn from nature what it had to teach about the real meaning and purpose of life. He was a romantic who took seriously William Wordsworth’s admonition to find the answers in communion with nature. Thoreau spent much of his time observing and experiencing all the wonder and beauty of nature. He did not find evidence of God’s handiwork in nature. As a transcendentalist, he saw nature as divine. And since man is a part of nature, he is divine. In his retreat to Walden Pound Thoreau found what the hippies of the 1970s searched for but never found. Strangely, Thoreau did not remain in his Garden of Eden around Walden Pound. After two years, two months, and two days of meditation he returned to civilization, to Concord, Massachusetts, where he lived until his death in 1862. This entry was posted in Historian's Almanac and tagged Henry David Thoreau, meaning of life, romanticism, Thoreau, transcendentalism, Walden, Walden Pound, William Wordsworth. Bookmark the permalink.